This impressive 5 bedroom, 3 bathroom villa has a large private pool surrounded by a spacious garden laid to lawn. From this pleasant outdoor space, you can enjoy views over the Portuguese countryside towards Galé. Villa Barreto is a few minutes' drive to Vale de Parra by car, and the facilities of Albufeira, Galé and Guia a little further on. There is also shared access to a tennis court. Pool heating, WiFi, and air conditioning/heating in the bedrooms are included. The spacious gardens, large pool and countryside views create the perfect, relaxing retreat. What's more…there's a shared tennis court too! Villa Barreto is set in generous grounds, which surround the large, kidney-shaped private pool. Walls and mature hedges enclose the lawn and terrace adding a touch of privacy. There is ample space for children to run around whilst you relax on one of the sunbeds. The dining table and chairs are on the covered terrace - perfect for dining alfresco in respite from the sun. At the far end of the garden, there is also an ornate table with seating. There is shared access with a neighbouring villa to a tennis court (basic rackets/balls are provided). It is also marked for football and has a basketball ring. There are gates from the street leading onto the large private driveway with plenty of space for your hire cars. The front door opens into a hallway. The open plan living area is straight ahead of the entrance hall. There is comfortable seating at one end with the dining table and chairs at the other side of the room. Patio doors open onto an attractive covered terrace with overhead bougainvillea, overlooking the pool and gardens. The fully equipped kitchen is adjacent to the living area and has a breakfast table with chairs. There is a door out into the garden. On the ground floor, there are 2 twin bedrooms, 1 double bedroom and 2 separate shower rooms. Marble steps lead up to the first floor and remaining bedrooms. There are 2 double bedrooms sharing a separate bathroom, each with a private balcony overlooking the swimming pool and gardens to Galé in the distance. There is a games room on the first floor where the pool table is situated, along with a small seating area. Patio doors lead out onto a terrace. This villa is registered and licenced by the Portuguese Tourism Board and local council. This number is: 1389/AL. Villa Barreto is located in the countryside with a few restaurants, cafes and a mini market within walking distance. It's 5 minutes' drive to Gale and Lourenço beaches, as well as the resort of Guia- the birthplace of the popular chicken Piri Piri. There are many places to visit by car - Lourenço beach and the main resort of Albufeira is around 20 minutes' drive with cobbled streets lined with restaurants, bars, cafes and shops. For those who love Golf, Villa Barreto is also ideally located as the very popular Salgados Golf Course is around a 10 minutes' drive. There is a local market every Tuesday in Albufeira and the municipal fruit, fish and vegetable market, is open every morning except Sundays. The Algarve Shopping centre is situated in Guia, which is around a 10 minutes' drive away and has a large supermarket and designer shops. 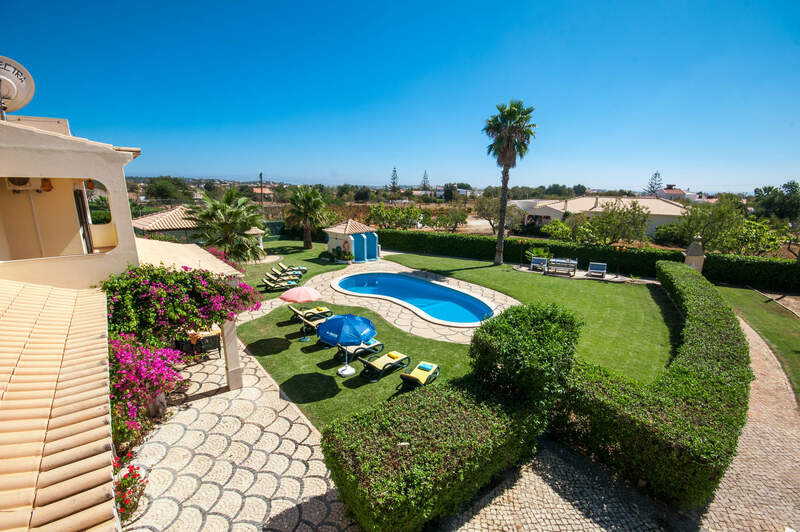 There are a few restaurants and cafés within walking distance to Villa Barreto and a wider choice in the resort of Albufeira which has a diverse range of restaurants. The nearby town of Guia is also well worth a visit if you plan on dining out- well known for the famous birthplace of the traditional Portuguese dish chicken piri piri, it has some fantastic restaurants to enjoy. The nearest beaches are Gale and Lourenço with just a 5 minutes' drive away. Several other lovely beaches are located along this stretch of coastline, such as Coelha, Praia Grande, Salgados and Sao Rafael. All of these beaches have snack bars and restaurants for when you need a break from soaking all that sunshine. Zoomarine is an exotic marine life theme park home to hundreds of fantastic and fascinating sea creatures, well worth a visit. Alternatively, Parque Aventura is situated in Santa Eulalia, Albufeira. It comprises of a paintball centre and various adventure courses through the trees made up of zip wires, bridges and ropes. Salgados Golf Course is just over 1 ¼ miles from Villa Barreto and is one of the many Golf courses in the Algarve. The par 4 seventh is rated amongst the best holes in Portugal. The final three holes decrease in difficulty allowing golfers to ease up after a testing first 15. Villa Barreto is not available to book for season as it is sold out. Take a look here at the Algarve villas that are currently on sale. We thoroughly enjoyed our holiday and would happily book again with Villa Plus. I would, without hesitation, recommend this villa. The location and the villa were faultless. Superb for all age groups and the best we have ever experienced. Great villa with excellent facilities for our extended family of 10 with an age range of 2 to 70. Great fun was had by all. Having local shops within a 10 minute walk was handy. Lovely beaches nearby. Wish we were still there !